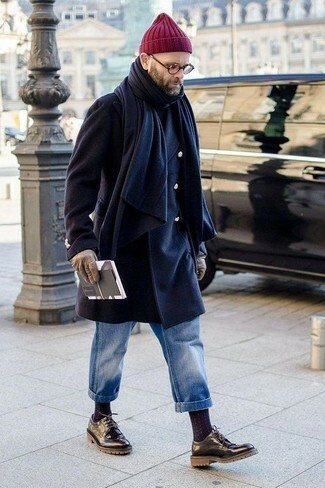 Try teaming a camel overcoat with Levi's blue jeans for a smart ensemble. To give your overall look a more casual feel, why not complement your outfit with white leather high top sneakers? 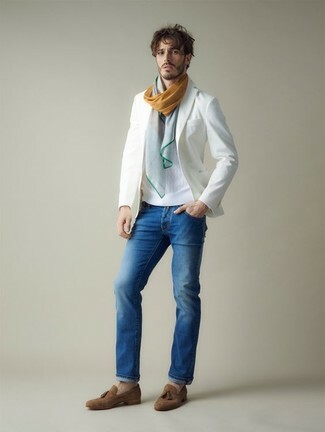 For a casually elegant outfit, pair a white blazer with blue jeans — these two pieces play perfectly together. 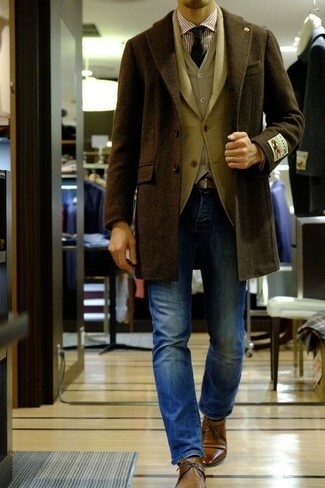 A pair of brown suede tassel loafers will bring a strong and masculine feel to any outfit. 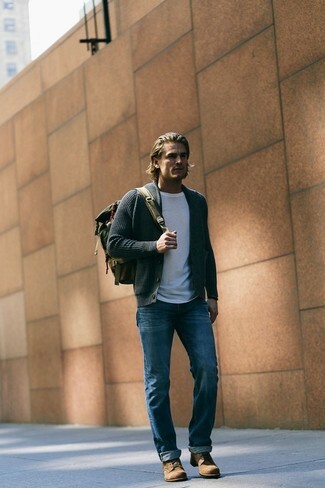 For a casual outfit, make a navy barn jacket and Levi's Vintage Clothing Light Wash Jeans your outfit choice — these items work perfectly well together. If you're in search of a casual yet sharp look, rock a charcoal shawl cardigan with blue jeans. Both garments are totally comfortable and will look great together. 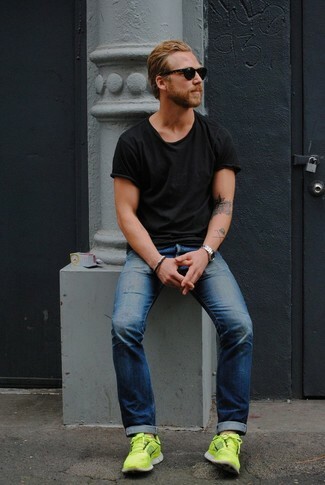 When it comes to shoes, this outfit is finished off well with brown suede casual boots. Contrary to what you might believe, outfiting on-trend doesn't take that much time. 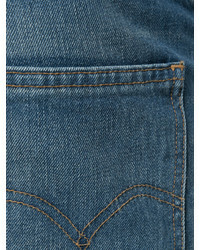 Just pair a navy linen blazer with Levi's vintage clothing light wash jeans and you'll look wonderful. 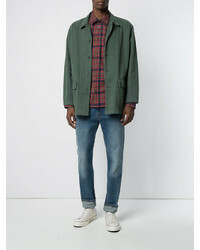 For a smart casual getup, consider pairing a dark brown overcoat with Levi's vintage clothing light wash jeans from farfetch.com — these items fit pretty good together. Brown leather derby shoes will bring a classic aesthetic to the outfit. 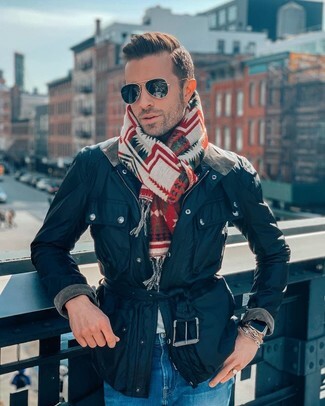 If you're on the hunt for a casual yet on-trend getup, reach for a brown shearling jacket and blue jeans. Both garments are totally comfortable and will look great paired together. 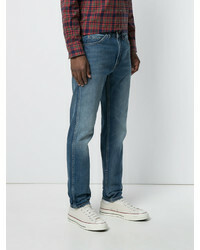 If you're in search of a casual yet on-trend getup, rock a black crew-neck t-shirt with Levi's vintage clothing light wash jeans. Both items are totally comfortable and will look great paired together. Want to go easy on the shoe front? Throw in a pair of green-yellow athletic shoes for the day. 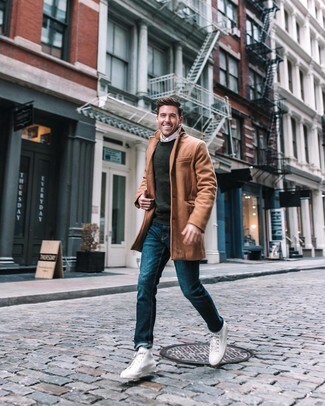 This combo of a navy overcoat and Levi's vintage clothing light wash jeans is super easy to throw together in no time, helping you look amazing and ready for anything without spending a ton of time combing through your closet. Up the ante of your ensemble with black leather derby shoes.